Ready for a healthy salmon & quinoa dinner recipe that you can whip up in 15-25 minutes? This one works well, if you use cooked-ahead quinoa and grilled salmon! 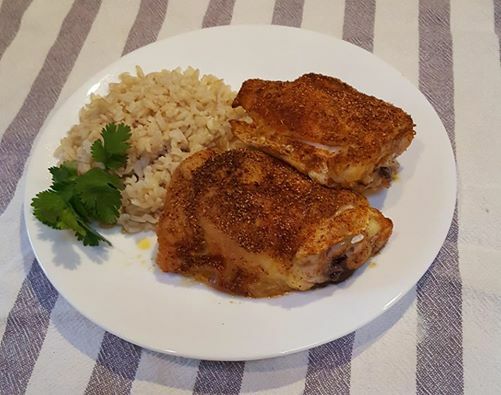 This dinner is a favorite quick choice around here because we ALWAYS have cooked quinoa on hand from our Sunday meal prep for the week, and usually leftover grilled salmon or the type that comes already cooked in a can. Combine the flaked salmon, cooked quinoa, egg and seasonings together with hands or wooden spoon in a medium bowl. Form 4-6 small patties (palm size) out of mixture and place them on a flat plate. Turn a small nonstick frying pan on medium heat, and drizzle a small amount of olive oil into pan. Once oil is heated, gently slide in the patties and allow them to brown on each side (about 3 minutes per side.) Once completely browned to a golden crisp on each side, remove the patties and drain on a paper towel-lined plate. While patties are cooking, stir together Greek yogurt, seasoning, ½ lemon juice and grated peel. Serve lemon cream sauce over patties along with your favorite side! This recipe is a sampling of the resources we share here to help you eat FRESH, healthy and whole! We would LOVE to hear how you like it–so stop by our Facebook Page and let us know what you think of this Salmon Quinoa Patties Recipe! Serve lemon sauce over patties along with your favorite side!